The now defunct UK toy maker Pic Toys Ltd of Harrogate North Yorkshire were licenced by Woodland Animations in 1984 to make a range of carded Postman Pat figures. These were called ‘Postman Pat BBC TV Collectables’. They were made in maleable molded plastic, brightly painted and stood in fixed poses. 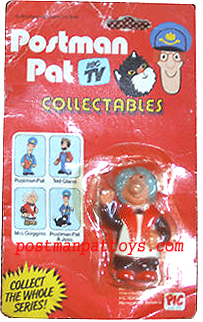 The range included Ted Glen, Mrs Goggins and Postman Pat variants including Pat with Jess, Pat with brown mailsack and Pat with red mailbag. 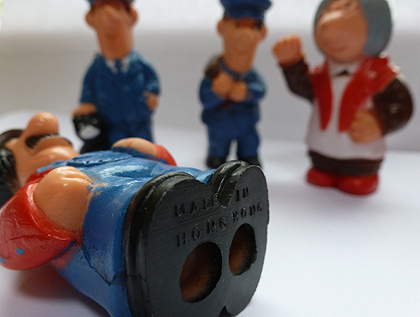 PIC Toys Postman Pat figures were manufactured in Hong Kong. 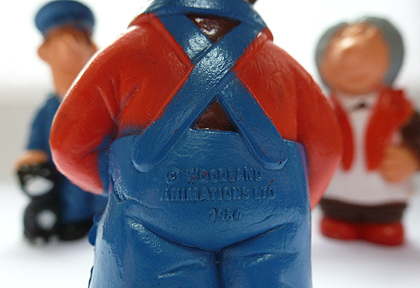 This is an easy way to identify the loose vintage figures because they are stamped on the foot ‘Made in Hong Kong’; elsewhere on the figure should be ‘copyright Woodland Animations 1984’. They are the very first carded range of Postman Pat figures. 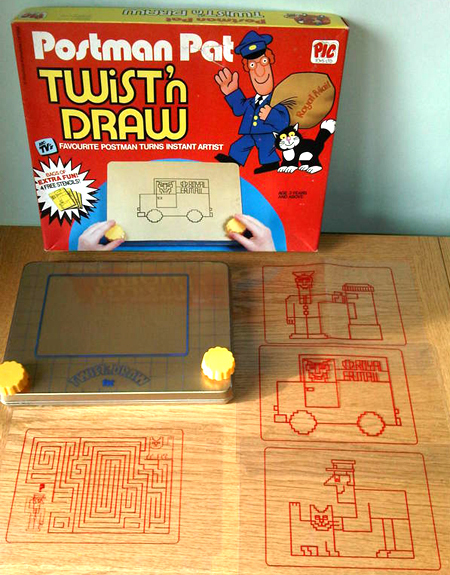 Pic Toys Ltd also made the Postman Pat Twist ‘N Draw toy, more commonly known as etch-a-sketch. This boxed toy, a classic of retro packaging, came with the wonderful tag line ‘Favourite Postman Turns Instant Artist’. The Twist ‘N Draw set included four free stencils. Pic Toys Ltd were better known for making a range of board games in the 1980’s. 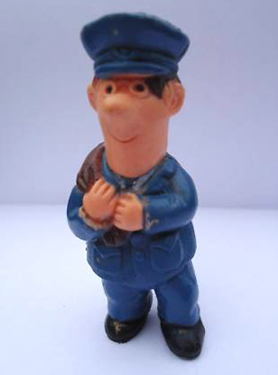 The vintage Postman Pat figure pictured above with brown hair and mailbag is marked ‘Woodland Animations Ltd 1984’ and is one of the vintage Postman Pat figures made by PIC Toys Ltd. On the foot it says ‘Made in Hong Kong’. The figure is in solid molded plastic, but fairly maleable. Certainly amongst the first Postman Pat figures ever made along with the Bendy Toys Postman Pat and the wind-up walking Pat by ERTL.